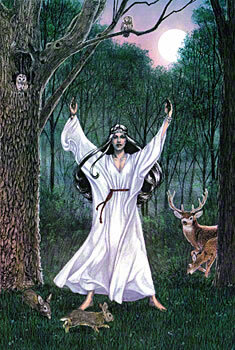 This is one I did for the cover of Living Wicca by Scott Cunningham, published by Llewellyn Worldwide in 1993. It's Prismacolor Pencil on Canson MiTentes paper. 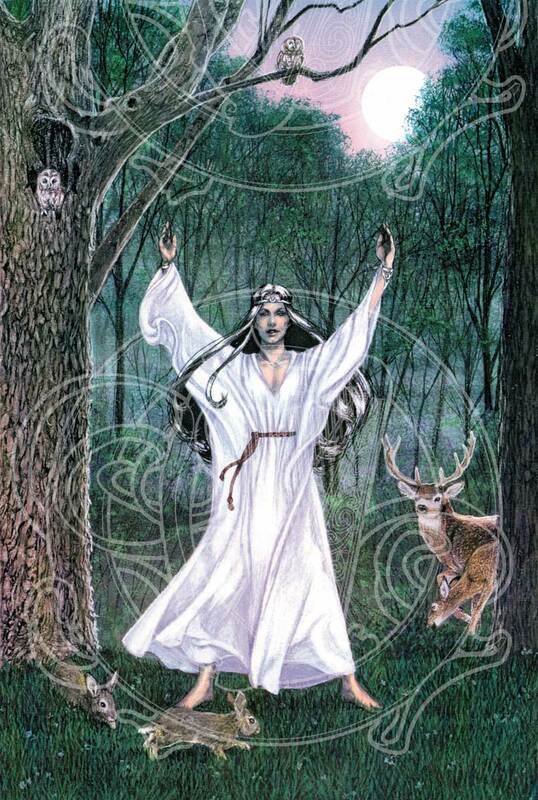 The assignment for this specified a priestess who looked like the High Priestess from my Tarot Deck; but the whole figure, in the woods or something. So, naturally, that's what I did. When I was working on the tree in the foreground, I decided to go outside and actually sit in front of a tree to draw the bark. Field work, you know. But I sat there for so long, and moved so little, that the birds who wanted to visit the feeder I had in that tree decided I was no threat, and came and ate anyway, hopping all over the ground only inches from me. Fun! This print is now available from my Zazzle store. Prints from Zazzle aren't signed, but you can choose any size you want, printed on any of the various Zazzle papers (from cardstock to canvas.) The default size for this print is 10.38x15 inches. But you can get it printed in any size you want. So, go to the Moon's Daughter Print in the Zazzle store if you'd like one!